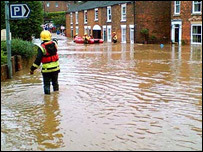 Emergency planners in Lincolnshire are warning people not to be complacent, despite no new flooding after rainfall over the weekend. Officials had been concerned that heavy saturation of the ground would make the area vulnerable, but no major incidents have been reported. The Environment Agency still have flood warnings in place on rivers between Lincoln and Sleaford. Showers have been predicted for the area on Monday and Tuesday.